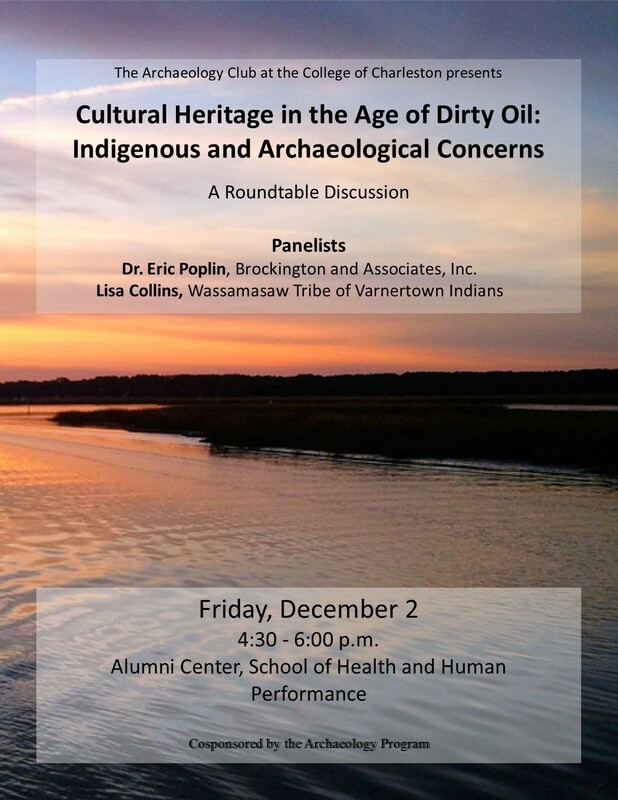 Friday, December 2, 4:30 – 6:00, EHHP Alumni Center. 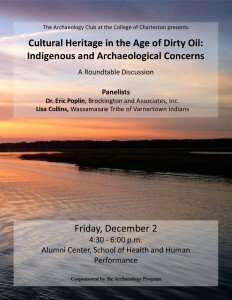 “Cultural Heritage in the Age of Dirty Oil: Indigenous and Archaeological Concerns”. Free and open to the public. Recent events in the Dakotas highlight the delicate balance between the desires for development and the needs for cultural and environmental protection. Often viewed as diametrically opposed forces, this need not always be the case. The evening’s discussion will focus upon recent conflicts in environmental and cultural heritage management as a way to see if and how greater dialogue and procedural reform can create a system built upon a shared notion of sustainable development. 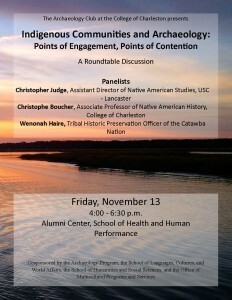 The Archae ology Club, as a part of Native American History Month, is sponsoring a roundtable discussion on Friday, November 13 from 4:00 to 6:30 in the Alumni Center of the School of Education, Health, and Human Performance. Cosponsored by the Archaeology Program; the School of Languages, Cultures, and World Affairs; The School of Humanities and Social Sciences; and the Office of Multicultural Programs and Services.